On Nov. 19, the Pit hall of the New National Theatre, Tokyo, in Shibuya, was filled with hundreds of eager theater-goers. They had come to see a performance of “Onna Goroshi Abura no Jigoku” (“The Women-Killer and the Hell of Oil”), a play written by Chikamatsu Monzaemon (1653-1724) — Japan’s greatest dramatist, known for his kabuki and traditional bunraku puppet works. For this version of the play, however, the performance was to be far from traditionally Japanese. In the NNTT show, Mayumi Kagita, one of Japan’s most famous flamenco dancers, and her husband, choreographer and director Hiroki Sato, took the well known play and created a fusion of kabuki and flamenco, which was staged by the couple’s Arte y Solera dance company. Kagita herself convincingly played the male lead — the villainous Kawachiya Yohei — by dancing in a powerful, masculine style. 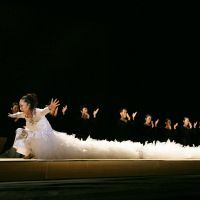 Accompanied by Spanish guitar, songs and percussion, Kagita strutted across the stage like a prancing stallion, showing her marvelous zapateado — the flamenco technique whereby dancers create rhythm by stomping or tapping their feet. However, though Kagita’s interpretation of the passionately wild male character of Yohei showed her flexibility as a dancer, she normally plays female roles. In an earlier performance she took on the role of the heroine in “Flamenco: Sonzaki Shinju” (Flamenco: The Love Suicide at Sonezaki”), another play based on one of Chikamatsu’s representative works. “Sonezaki Shinju” is based on an actual incident and is popular for its tragic tale of an ill-fated romance between a shop clerk and a prostitute who had no choice but to kill themselves in order to be together forever. 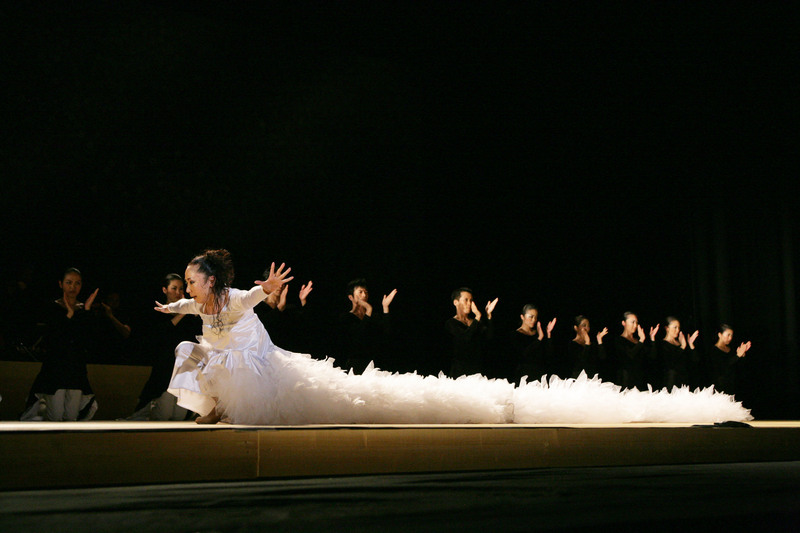 The Arte y Solera version of the story was first shown to the public in Tokyo in 2001, and the remarkable blend of traditional Japanese and Spanish performing arts achieved great success — winning second prize in the Theater Category of the Japanese government’s Agency for Cultural Affairs Arts Festival in 2001. 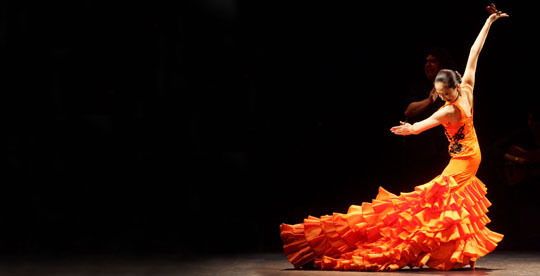 In 2004, “Flamenco: The Love Suicide at Sonezaki” was further honored by being the first official performance of a foreign dance group at the Festival de Jerez flamenco festival in Jerez, Spain, the birthplace of flamenco. 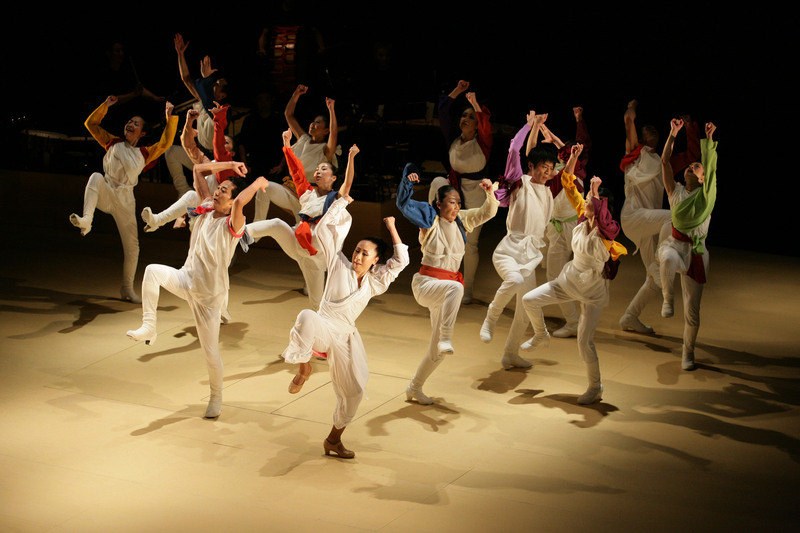 Following on from that successful mix of Japanese drama and Spanish dance, in 2010, Kagita and Sato created a flamenco show based on another traditional Japanese performing art. This time basing it on “Dojoji,” a tragic love story written by Kanze Kojiro Nobumitsu in the 15th century and one of the most well-known masterpieces performed as a noh play. In early December, Kagita, the now 46-year-old flamenco dancer and instructor of Spanish dance, spoke to The Japan Times about her creative process from her studio in Tokyo, a few weeks before heading back to Jerez in Spain, her second home. Since I was small, I danced whenever I listened to music at home. But, I actually began to learn dancing when I was 6. Some of my friends had started taking modern ballet lessons, and they showed me their leotards. I thought, “I want to wear that!” So, I asked my parents if I could visit the dance studio in Shimokitazawa (Tokyo). They said yes. When I saw my friends dancing, I couldn’t sit quietly! And I began dancing in my usual clothes. Did you continue taking modern ballet lessons throughout childhood? Yes. When I was an elementary school student, I went to lessons after school. In junior high, what did you do as an extracurricular activity? Did you continue to enjoy the dance club and modern dance lessons when you were in high school? No, actually. I started going to discos after school. I kept it a secret from my parents (laughs). I was a bad girl! I went to discos in Shibuya and Shinjuku with my friends from the theater company. Some were actually in Kabukicho (Tokyo’s adult-entertainment district, in Shinjuku). How did you hide that from your parents? I lied to them, saying “I am going to stay at my friend’s house.” Some people imagine that my reason for going to that kind of place was to hunt boys. But I went there to dance. What kind of music was playing there at the time? Michael Jackson and other soul music. Earth, Wind & Fire was very popular, too. It was around late the 1970s, early 80s. I read in an article that you were influenced by the movie “Saturday Night Fever.” Is that true? Yes. The film triggered the disco boom in the United States, which spread to Japan. I was dancing to that kind of music. Dancing on a dancefloor was a different kind of fun from that in the studio. With modern ballet, I tried to dance beautifully. It was healthy and sound. At the disco, if my dancing wasn’t any good, nobody watched me. But, if I danced well and I looked attractive, people watched me. It was thrilling and exciting! After graduating from high school, you entered the dance department of Japan Women’s Junior College of Physical Education. Did you choose that college to make dancing your career? I hadn’t decided that then. I didn’t have a subject I felt I was good at. But I had to select something to study. So I continued dancing. In college, what kind of dance did you learn? I learned various dance styles. I took classes in Japanese traditional dance, pantomime, modern dance, classic ballet, and rhythmic gymnastics. When did you first discover flamenco? I encountered it in a class of Spanish dance. Before that, I’d seen flamenco on TV. But I saw the dance live for the first time in that class. It was taught by a Ms. Keiko Sato. What was your first impression of flamenco? Ms. Sato was so skinny but she stomped the floor and made such a big sound. I was surprised by the impact of her dance. I had never seen that way of beating the floor with your feet. In ballet, dancers never make a sound with their steps. Is that right? Yes. When they dance the audience rarely notices the dancers landing after a jump. They are required to be light on their feet and land on the floor quietly. Is Ms. Sato’s class why you became so interested in Spanish dance? Yes. It was a completely new genre for me and I was so interested in it. I studied hard, and for my graduation performance I chose flamenco. Even before graduation I had started going to Ms. Sato’s private studio to take her lessons. The depth of flamenco intrigued me. I wanted to learn more, so I joined Sato’s dance company. Did you become a professional dancer straight after graduation? I couldn’t make my living by dancing at that time. But I wanted to dance professionally. How many years did you work as a dancer with Sato’s dance company? I graduated college at 20 and then spent 5 or 6 years with the flamenco company. Ms. Sato and other instructors often created new performances, so I had many chances to perform on stage. I heard there are several basic types of flamenco music and dance. While the kinds of flamenco music are limited, a performance can consist of various parts; including a part in which dancers perform with a singer; another in which only the dancers’ steps create the beat, and one in which dancers perform with a guitar melody. For example, there’s a song called “solea.” Many people dance to solea, but the choreography of each dancer is different. It is called the “mother of flamenco” and means “solitude.” It has a great influence on other songs and tunes. There is also a traditional flamenco song called “alegria” meaning “pleasure.” However, the dance company I belonged to, which was led by Ms. Sato and Mr. Yasushi Yamazaki, created new flamenco performances with stories and messages. After working as a professional dancer in Sato’s company, what did you do? While I still belonged to the company, I had the chance to compete in a Spanish dance contest organized by the Contemporary Dance Association of Japan in 1990. Fortunately, I won an award called the Kawakami Suzuko Spanish Dance New Performer’s Award. After that, I thought to go forward I must go to Spain. In 1991, when I was 25 years old, I flew to Spain. In which city did you learn flamenco? Madrid. I entered a flamenco school named Amor de Dios, which had about 10 studios of various size. How was life in Madrid? I practiced flamenco from morning to night everyday. I had never practiced so hard before. What was the difference between the flamenco that you learned in Japan and that in Spain? The senior students at the flamenco company in Japan where I had studied told me that what they had learned in Japan did not work in Spain. So I felt nervous before going to Spain. But once I got there, I didn’t experience problems from a difference in techniques. The only thing found I difficult was living in an environment in which I was very obviously a minority. I couldn’t really understand the Spanish language. And the food and gestures were different. The gestures from daily life are used in the choreography of flamenco — and that is more difficult for Japanese to learn than it is for Spanish. Spanish dancers have confidence. They try hard to show off their dancing even when their technique is not perfect. Japanese dancers often hesitate when they perform. I learned that I should be more upfront. I remembered that some Spanish people used to curse me in the street and call me “China,” because they thought all Asians were Chinese. It was not only me that experienced that (kind of misunderstanding), but also other Japanese. Nowadays though, that doesn’t happen as much. I was sad at the time: Not because I was mistaken as Chinese, but because I realized that some people discriminated against other races. But, gradually I began to think that maybe I was called “China” because I stood out, so I answered back, smiling and saying “Thank you, but I am Japanese,” and walked away. How long did you study flamenco in Spain? I went there in January 1991. It was around the time the Gulf War started. It was terrible. I was told not to go to British department stores in Madrid (because of the threat of terrorism at the time). However, as a result, I had no problem. I came back to Japan in July. 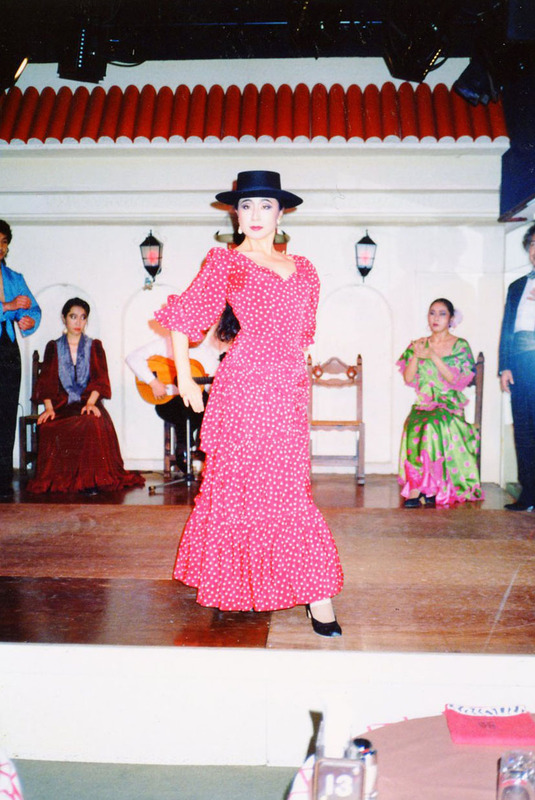 When you went to Spain, were there other Japanese dancers who were learning flamenco? I heard that the number of flamenco dancers in Japan is the second biggest in the world, after Spain. Is that true? It’s actually possible that there are more flamenco dancers in Japan. Why do you think flamenco is so popular here? People think that the Spanish are more passionate than the Japanese — who are seen as more reserved. But in fact I found that though Spanish often use strong words, there are many shy people in Spain. The Spanish and Japanese characters are not so very different. 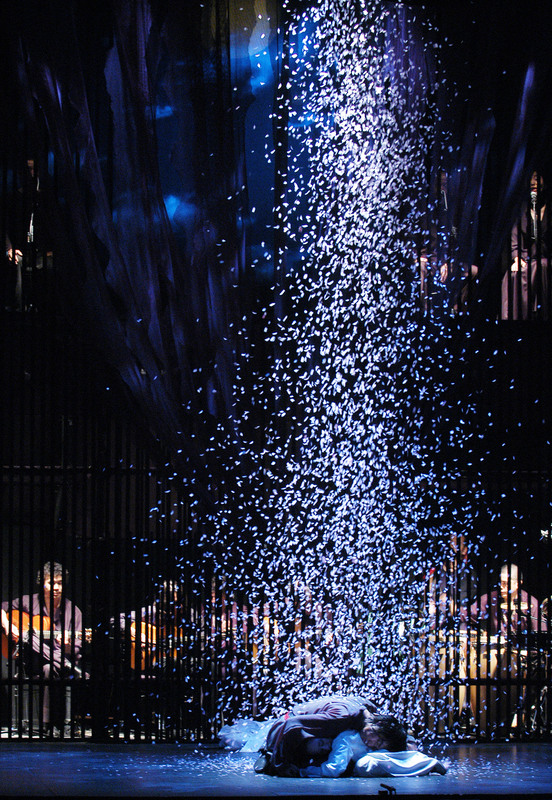 Flamenco and noh share some elements in style, too. In noh, musicians play at the back of the stage while noh actors and dancers perform up front. 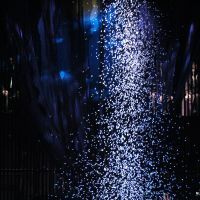 This is similar to flamenco where dancers and musicians communicate back and forth on stage through their voices and eye contact — much like playing catch — they can also sense each other’s breathing. Though the communication between musicians and dancers in noh is less obvious, the contact between the performers is similar. A pamphlet for one of your shows quotes the flamenco lyric “Someday you will realize how much you lost (by abandoning me)!” Do you think Japanese people like this kind of troubled relationship between lovers? Certainly. It’s not just flamenco; Korean TV dramas that focus on such relationships have also been popular among Japanese. Japanese probably like love stories about people who bear hardship. Which is why enka (Japanese ballads) is so popular. Enka songs are often about people who are so emotionally attached to their loved one that they even think of killing them. Japanese people suppress their frustrations about love, but the Spanish speak out and express their feelings. I believe the origin is the same. Flamenco originated among the Roma, (or Gypsies), who have long-been looked down upon by other people. I imagine the Roma released their hardships and frustrations by singing and dancing. Is that right? Absolutely. The Roma are often discriminated against. But in order to survive they laugh about their hardship. And that was the driving force behind flamenco. After you returned to Japan from Spain, what did you do? I began performing flamenco at Spanish restaurants everyday. To do this I needed a studio where I could practice, which led to me establishing a dance company. In 1993, my dance company created its first performance piece with several Spanish musicians. There were some people in the audience who saw me dance and asked me to teach them. One of them was Hiroki Sato (now Kagita’s husband). He was originally one of my students. He is interested in various types of music, including rock and classical, and since around 1995 he gave me new ideas for my flamenco performances based on his knowledge on music. We made some original flamenco dances based on his ideas. 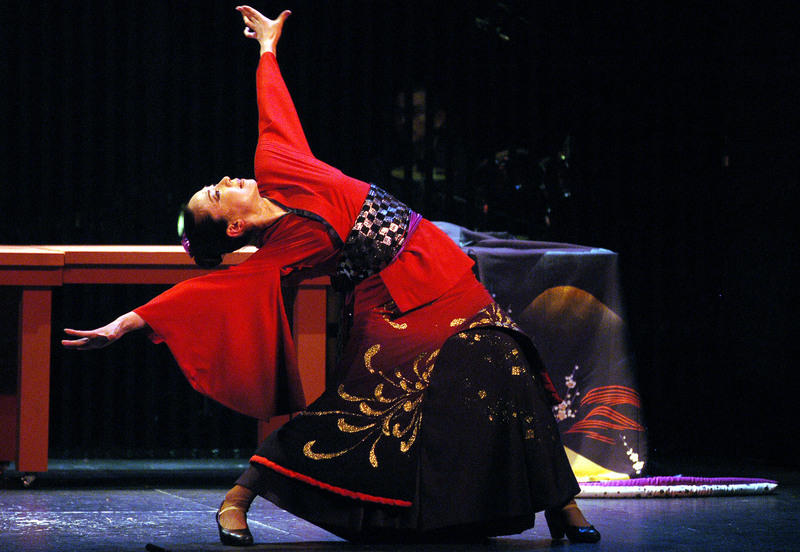 In 2001 you staged “Flamenco: The Love Suicide at Sonezaki.” What was the genesis of that show? A stage director I had worked with told Sato and I that, if we were going to dance flamenco as Japanese, we needed to think about making flamenco performances with Japanese themes. So we started planning that kind of show. Around that time, I performed at a restaurant owned by (song writer) Yoko Aki and (musician) Ryudo Uzaki. Aki told me that she wanted to remake her play “Rock Sonezaki Shinju” (1980) as a flamenco show. At the time, did you think elements of traditional Japanese drama and flamenco could work in harmony? Yes. It was very natural to combine them. Despite being a challenge, it was surprising and fresh to dance to Japanese songs. The difficulty was to keep the rhythm of flamenco in the show. 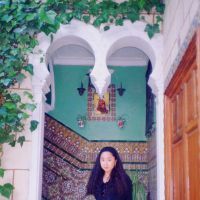 I consulted Aki, Uzaki and Japanese singers of Spanish songs on how to add Japanese lyrics to flamenco music, and they helped me a lot. For music we used Western and Japanese instruments, including Japanese drums, shinobue flutes, biwa banjos, and of course flamenco guitars. The love-suicide seems to be a form of love story that is prominent in Japanese culture. What do you think? I don’t plan to commit love-suicide (laugh). But it is something found in both enka songs and flamenco. Being patient and enduring hardship is kind of a Japanese characteristic, especially in the cold climate of northern Japan. After such perseverance, the last choice for a loving couple was sometimes to kill themselves and seek happiness in the afterlife. 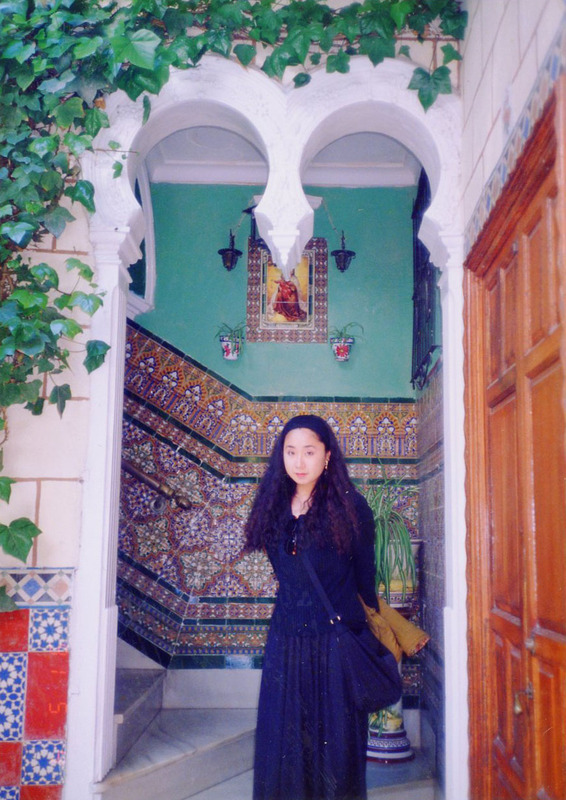 In 2004 you performed “Flamenco: The Love Suicide at Sonezaki” in Jerez, Spain. What was the reaction? The audience was so excited, it was surprising. In Japan, the audience didn’t know when they to applaud. But in Jerez, we had applause at the end of each act and had calls from the audience. This is what is called jaleo, and is a Spanish tradition of making the show exciting. At the finale, the audience gave us a huge round of applause and some of them were crying. I was so moved. To help the audience understand the story, we had narration in Spanish between each act. After seeing the performance, some people said it reminded them of “Romeo and Juliet.” They understood this Japanese tragedy and their reaction gave me confidence. In your dance company, you not only teach professionals but also amateur dancers. In a previous interview you once said that you felt students become more beautiful as they learn flamenco. Why do you think they change? There are two types of beginners in flamenco: Of course neither is good at dancing at first. But some students are not embarrassed when they see their poor dancing in the mirror. Others are shy and try to hide themselves from others. The students, who are not embarrassed, are often sociable and open to the others. The other students need more time to feel comfortable looking at themselves in the mirror. But gradually they improve, such as by making better stepping sounds, keeping rhythm more accurately, or the way their arm movements begin to flow. When their instructors point out their progress, or they realize it themselves, they change — they want to see themselves dancing in the mirror. Do they get more confident? Yes. And they change. They don’t change their makeup, but their facial expression becomes richer and they seem to shine — their inborn beauty starts to show. Everyone can benefit from learning to dance. Do their bodies change too? Yes. But that doesn’t mean the students become skinnier. Flamenco does not suit skinny dancers like those who do ballet. Toughness, strength and feminine bodies are required. As people practice flamenco, their muscles change and their strength gradually begins to appear from the center of their bodies. If you are originally slender, the muscles of your hips will start to stand out; If you are chubby, you body will become well built. I think many people have complexes about their bodies. Does this change when people learn to dance flamenco? Yes. People who dance realize it is good to be aware of their own body’s particular characteristics. Unless we have surgery, we all have to live with our bone structure, height and the way we are built until the day we die. But if we find some advantage in any characteristics that we feel are inferior, that advantage can become our weapon. For example, tall dancers can use a lot of the space around them during their performance, which creates a showy atmosphere. On the other hand, short and small dancers can be quick at stepping and turning, creating a sharp impression. What is your secret to keeping your body young and beautiful? I guess it is exercise and sweating every day. That is the routine of my life. When I don’t sweat, I feel unwell — it’s like not sleeping well. (Exercising) can make a big difference. Another good thing about dancing is being able to express yourself. Personally, I prefer not talking with others in my private life — I communicate with people by dancing. You will have a performance in Shizuoka in March, titled “Subete wo Koete” (“Going Over All”) using dancers with disabilities. In 2006, you held the same kind of show for the first time. Can you explain how this project came about? Before Sato started learning flamenco, he had been volunteering at facilities for the disabled and held a care worker license. Sato and his friends from the volunteer activities thought that children with disabilities would enjoy dancing flamenco. So Sato began to teach flamenco at the facilities. He found that the children were passionate and had a way of expression that was similar to what Spanish flamenco dancers and singers have. I was surprised to see the way the children danced. When Sato told them to dance and sing, they start shouting. Their voices sounded like they were shouting from the bottom of their hearts. In 2012, you are also planning various other performances. What is your goal for the future? It’s hard to set a goal, but I will continue dancing until I die, and I want people to see my dance. Because flamenco is from a very traditional and indigenous culture, I still have many hurdles to clear. I want to continue to devote myself to understanding flamenco deeply, to be immersed in this art born in Spain. But at the same time, I acknowledge that when I dance flamenco it is significant that I’m Japanese — which is why I believe it is important to create flamenco performances with Japanese themes. This mix appeals to audiences. So far, I have been fortunate to encounter Japanese themes in natural ways, but I want to be more aggressive in seeking Japanese subjects, in the future.